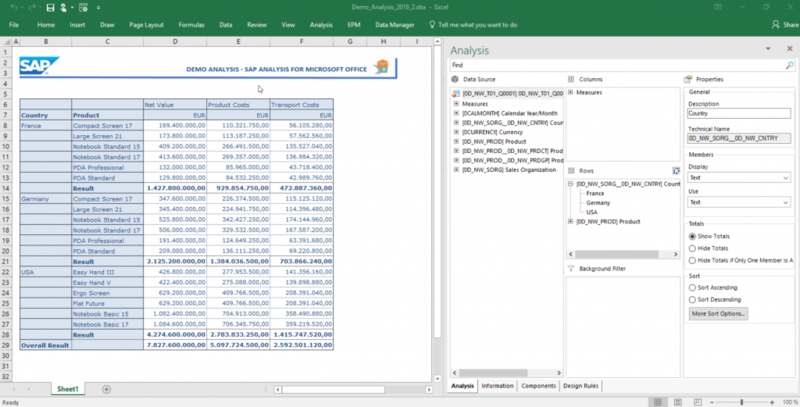 SAP BusinessObjects Analysis for Microsoft Office (A/O) is an analysis tool for multidimensional data (OLAP analysis). It consists of three plug-ins: Analysis Plug-in, EPM Plug-in and BPC Plug-in. These plug-ins have been merged into one Microsoft Office add-in. 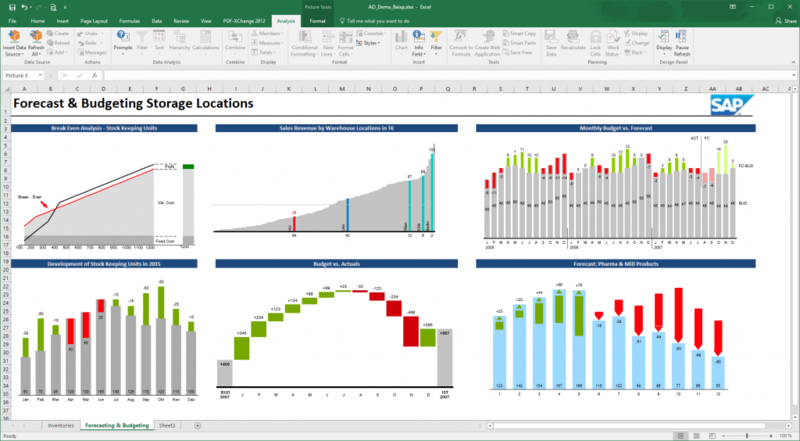 They support cross-table analysis in Excel along with the creation of Excel-based reports with alerting and highlighting features as well as flexible report layouts. A/O is typically shipped with SAP BO BI platform and SAP Analytics Cloud. SAP was founded in 1972 by five former IBM employees but really came into prominence in the 1990s with the ERP boom. Its ERP solution (R/3) was first released in 1992. The vendor employs over 93,000 people worldwide and has a turnover of over € 22 bn. It is one of the largest business software vendors in the world. SAP launched its packaged SAP Business Warehouse BI solution, which included data storage and front-end components, in the late 1990s. To support a broader user spectrum than was possible with SAP BEx (the SAP BW front ends), the vendor acquired Business Objects in 2007 and complemented it with the self-developed SAP BusinessObjects Analysis for Microsoft Office (SAP A/O) and SAP Lumira. All of them are packaged together as SAP BusinessObjects BI platform. Until 2018 SAP claimed to be following a dual analytics strategy with its front ends, which was aimed at delivering continued innovations for on-premises solutions while building new cloud solutions. However, this year was a significant one for SAC as it was named as SAP’s strategic data discovery product. At the same time, SAP set its BusinessObjects BI suite, including all related components (SAP Crystal Reports, SAP BusinessObjects Web Intelligence, SAP Analysis for Microsoft Office and SAP Lumira) on maintenance by ensuring support beyond 2024 as well as the release of SAP BO BI 4.3 in 2019. The roadmaps for SAC and SAP BO BI clearly show that all functional innovation will go into SAC while any improvements to SAP BO BI are likely to be of a more technical nature. SAP BO Analysis for Office (Analysis Plug-in) typically supports NetWeaver (SAP BW), SAP BO BI platform or SAP Analytics Cloud using the respective repository with its structure and authorizations. 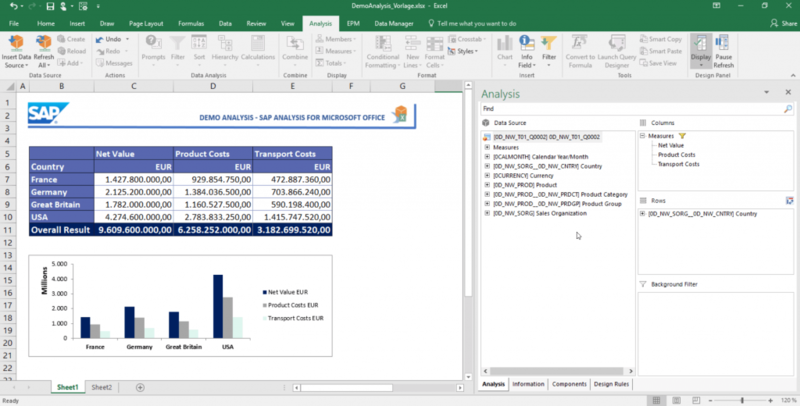 Analysis accesses the multidimensional-oriented data sources of SAP BW (BEx Queries, BEx Query Views and InfoProvider; as well as data from SAP ERP using transient InfoProvider), SAP HANA (Analytic or Calculation Views for example) as well as SAP Analytics Cloud’s Analytics-type and Planning-type models. 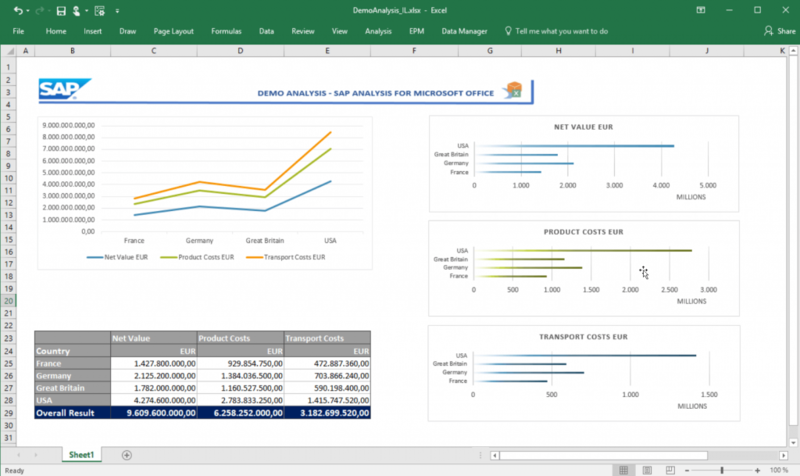 SAP BO Analysis is an Excel add-in focused on ad hoc analysis of multidimensional data. The product is primarily strong in querying SAP HANA and SAP BW data sources. Its EPM plug-in is also able to access other non-SAP data sources, and its ad hoc and analysis abilities are well reflected in the reported use cases and tasks performed by users. 85 percent of respondents use it for ad hoc query purposes and 90 percent explore/analyze data. The top five list of competitors underlines the software’s orientation towards business users. These business users tend to be smaller groups of users who analyze data and create standard reports. The percentage of employees using the software is 6 percent, compared to The BI Survey average of 17 percent. In contrast, companies that buy SAP BO Analysis tend to be rather large. The product is a direct front end to data and usually sits on top of SAP HANA or SAP BW data sources. This is partly reflected in the high mean value of 1322 users per organization. BARC’s Vendor Performance Summary contains an overview of The BI Survey results based on feedback from SAP BusinessObjects Analysis (Office) users, accompanied by expert analyst commentary. GREAT tool -- wonderful adjuncts to our ERP systems - leverages our investment in data and processes. Inzwischen vollwertiger Ersatz für Bex Analyzer mit zusätzlicher Funktionalität. 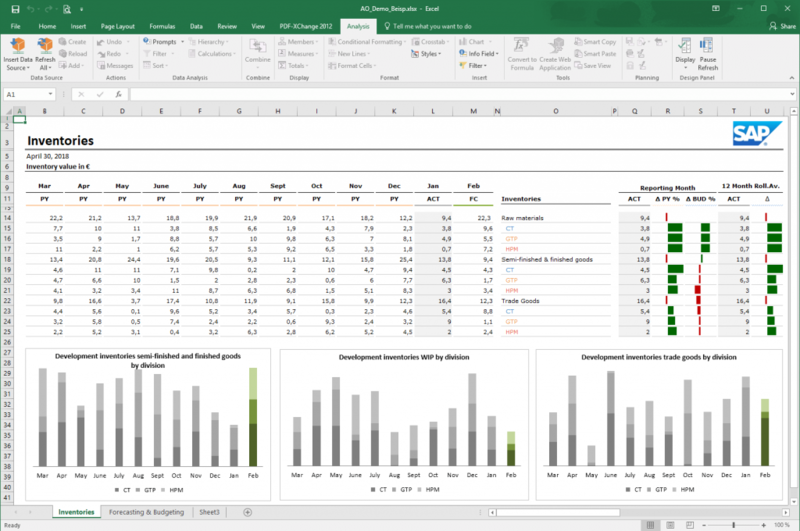 Hohe Akzeptanz beim Endanwender (weil vergleichbare Bedienung wie MS-EXCEL). Excellent product and SAP is good about investing in it. Good tool, easy to use and visually appealing.